1 oz. - 8" Overall length. Beautifully finished hammer heads & hickory handles. 5/8 Diameter heads - 9.5" Overall length. Hardwood handle and a solidly secured head. For non-marring delicate work like straightening small wires. Used for hardening and smoothing surfaces - 11 3/4" Overall length. 5/8 and 11/16" Diameter heads - 11 3/4" Overall length. 3-5\8" Head length. 5/8" Diameter Head. 5/8"x 1/8" Half-Round Bar Tail. Good quality ... for the price. 1" Diameter Flat Head and Hardwood handle. Polished 15 mm diameter Round Ball. Sturdy Hardwood handle. Useful to create hammered finishes without crescent edge strikes. Drop forged heads with hardwood handles. BALL PEEN - 4 Ounce. BALL PEEN - 8 Ounce. BALL PEEN - 12 Ounce. BALL PEEN - 16 Ounce. a much more comfortable and wieldy bench tool. 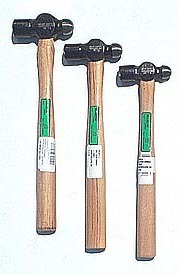 NYLON HEAD MALLET: 1-1/2 Dia. x 3-1/2 Head. Use this one on thin metals for less marring than rawhide mallets. 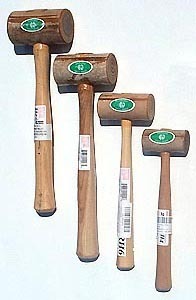 RAWHIDE 4oz MALLET: 1-1/4 Dia. x 2-1/2 Head. RAWHIDE 6oz MALLET: 1-1/2 Dia. x 3 Head. 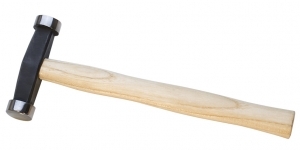 RAWHIDE 9oz MALLET: 1-3/4 Dia. x 3-3/8 Head.